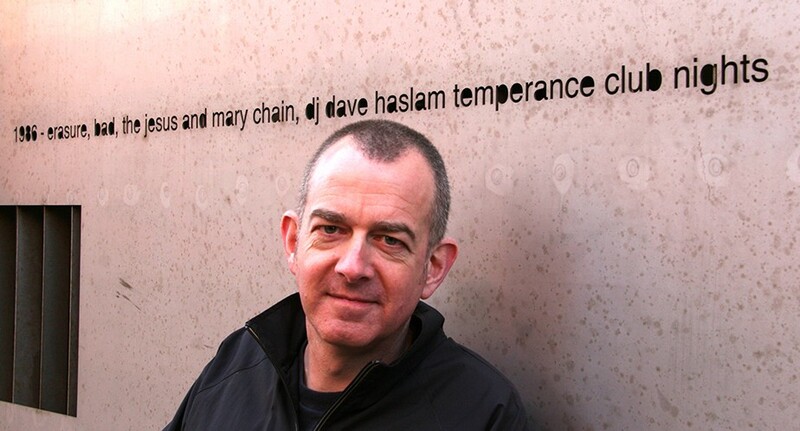 Dave Haslam is a writer, broadcaster and DJ who has DJ’d over four hundred and fifty times at the world-famous Haçienda nightclub in Manchester, England and has since DJ’d internationally. He has contributed to New Musical Express, The Guardian, The London Review of Books, and The Times, and is the author of several books including Not Abba, The Real Story of the 1970s and most recently Life After Dark: A History of British Nightclubs & Music Venues. I fell into a little by accident, in that I was a music journalist and live music promoter who hung around clubs and venues a lot. I volunteered to play before and after bands at one or two venues featuring live music, just setting the scene (beforehand) and rounding off the night with some appropriate tunes (afterwards). I enjoyed this, choosing and programming the music, and when one of the venues in question (the Man Alive) asked me to do the occasional night solo, without a band, they and I got great feedback, so it became a regular thing. This was 1985. Things evolve over thirty plus years. I guess my style has always been eclectic; on the night that made my reputation (Thursdays at the Hacienda in the late 1980s) I mixed electro, guitar stuff, hip hop, all sorts. I have never liked feeling constrained by being pigeonholed as a certain kind of DJ. I even played a record by the Smiths at ‘Cream’ at the height of that club’s devotion to trance (three quarters of the dance floor cleared, the other quarter went bonkers). My longest running weekly residency (Fridays at the Boardwalk) lasted seven years; there I mixed classic soul and funk with trip hop, hip hop and girly house. When I DJ now, I play mostly house from all eras, but I’ll throw in some electro pop, or a mash-up or whatever I want to play to make an impact. I use CDJs now. I sold all my vinyl to Seth Troxler in November 2015. It became big news – Seth took the whole collection to Ibiza this year! I am a Pioneer person. I like their 900 mixer and their CDJ 2000s. Partly because that’s what I’m used to and partly because I find them very solid and unfancy. I don’t want fancy or unpredictable equipment. When you start out on two Garrard decks with no vari-speed, and a mixer with so cross fader (as I did) then I guess the flim-flam of a lot of modern stuff leaves me a bit cold. I never play MP3, always WAV. But I genuinely think the sound is richer from 12” vinyl. I think that’s my favourite ever format. There were a few reasons I sold my collection, one of them was because there was stuff being released only available digitally and I wanted to play it and not be constrained by being a vinyl only DJ but also because the last three or four vinyl- only sets I played had been disappointing from a technical point of view. The last one was a venue with a thousand people in it but the sound set up just wasn’t right, the records were jumping, the EQs didn’t seem right – basically when once every club used vinyl and sound engineers understood the format and the equipment was embedded in the booth and everyone used it and glitches could be overcome over time, that last gig was somewhere that had hired in some decks and they’d built some crappy stand for them and the sound engineer didn’t have a clue. I thought, never again! Too much of a risk. Always Sennheiser. I usually go for something in the £40-£70 bracket. They’re robust and great value. I am getting better at looking after them. But one reason I am in the habit of getting relatively inexpensive headphones is that from 1988-1995 I probably stood on three or four pairs, left two or three in the back of taxis, and lent one or two to people and never got them back! Get as deeply into music as you can, and the techniques, but don’t forget to nurture your programming skills. Get out and play to audiences as soon as you can; that way you pick up an instinct for how you can make the music you love most the music that fills the dance floor in front of you.